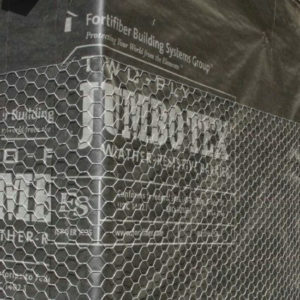 Fortifiber Weather Resistive Barriers | Salmon Bay Sand & Gravel Co.
Jumbo Tex addresses the requirements for weather-resistive barriers, while exceeding all standards for Grade “D” Building Paper. An asphalt saturated kraft paper, this cost-effective solution offers solid durability that resists tears and punctures on the jobsite. It provides an effective weather-resistive barrier behind stucco and brick – as well as wood, fiber cement and vinyl siding. 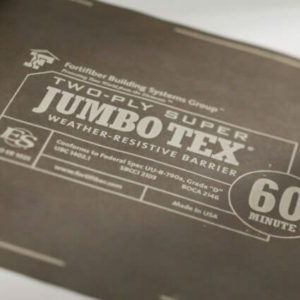 Super Jumbo Tex 60 Minute is the industry’s leading 60 Minute weather-resistive building paper. 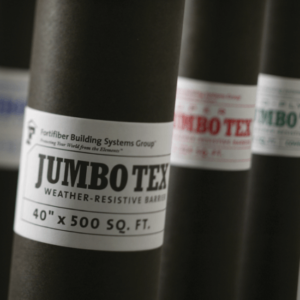 Super Jumbo Tex 60 Minute is used in production, custom residential and commercial construction where there is a need for a high performance weather-resistive barrier. The product delivers over six times the water protection of standard Grade “D” paper, while providing optimal breathability, to prevent the potential for moisture condensation within exterior walls.